Twin NASA probes exploring the harsh radiation belts around Earth have a new name honoring the late James Van Allen — the pioneering scientist who first discovered the radiation zones, the space agency announced today (Nov. 9). The heavily armored spacecraft were initially called the Radiation Belt Storm Probes when they launched in late August. They will now be known as the Van Allen Probes for the remainder of their two-year mission, NASA officials said. "James Van Allen was a true pioneer in astrophysics," former astronaut John Grunsfeld, associate administrator for NASA’s Science Mission Directorate, said in a statement. "His groundbreaking research paved the way for current and future space exploration. These spacecraft now not only honor his iconic name but his mark on science." "The Van Allen belts were the first discovery of the Space Age," Rick Fitzgerald, Space Department program area manager at Johns Hopkins University's Applied Physics Laboratory, said during the renaming ceremony today. 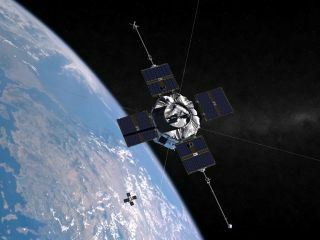 APL manages the Van Allen Probes mission for NASA. James Van Allen was principal investigator for studies on 24 Earth satellites and planetary missions during his long career, NASA officials said. The physicist worked on the first successful American satellite, Explorer 1, whose observations helped confirm the existence of the radiation belts. He also discovered similar belts around Saturn and detected one of the ringed planet's moons in 1979, among many other accomplishments. Van Allen died in 2006. The inner Van Allen belt usually extends from the top of Earth's atmosphere to about 4,000 miles up (6,437 kilometers), while the outer one runs from around 8,000 to more than 26,000 miles above our planet (12,874 to 41,842 km). The belts are dynamic, however, and can expand greatly during solar storms. The fast-moving particles trapped in the belts can damage satellites and potentially pose a threat to orbiting astronauts. As a result, scientists are keen to get a better understanding of the belts and their still-mysterious behavior. That's what the $686 million Van Allen Probes mission aims to do. The nearly identical spacecraft are flying in formation through the belts on highly elliptical orbits, mapping out the regions' magnetic fields and charged particle density with their eight science instruments. The mission recently kicked off its two-year primary science mission, having completed its 60-day commissioning period on Oct. 28. "Over the past 60 days, the many complex systems on the probes have come to life and started to work together," Kim Cooper, Van Allen Probes project manager at APL, said in statement. "The spacecraft’s science instrument teams are already recording illuminating data, and they are taking advantage of their best understanding of the mechanics and properties of the radiation belts to date."